I am a neutered male, brown and white Pit Bull Terrier and Labrador Retriever. The shelter staff thinks I am about 11 months old. I weigh 53 pounds. I have been at the shelter since April 22, 2011. DO NOT call and say you are adopting unless you are going to go down there and get the dog. It is a waste of the staff's time to explain the adoption procedure over the phone, for someone to purposely not show up? They need every free second of their time to process Lost and Found checks and care for the animals. Not to mention people will think the dogs is safe and then they die. STOP IT OR I WILL TAKE DOWN THIS PAGE!!!! Join in and write your own page! It's easy to do. How? Simply click here to return to Rescue Dog Form. My name is LIBERTY. My Animal ID # is A893549. 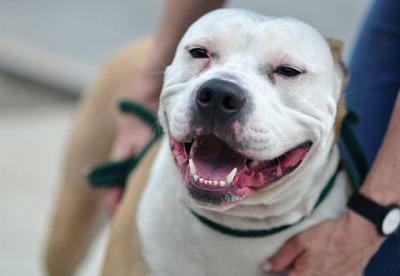 I am a female tan and white am pit bull ter mix. The shelter thinks I am about 3 years old. 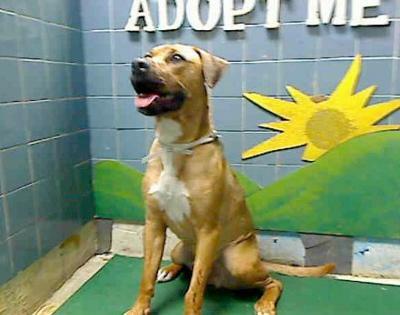 I came in the shelter as a STRAY on 04/12/2011 from NY 11208, owner surrender reason stated was STRAY. Reason for New Hope: DISEAS-ILL.
04/27/2011 Exam Type CAGE EXAM - Medical Rating is 3 C - MAJOR CONDITIONS , Behavior Rating is NO CONCERN, Weight 61.8 LBS. My name is BEAR. My Animal ID # is A894497. I am a neutered male white and tan amer bulldog mix. The shelter thinks I am about 3 years old. 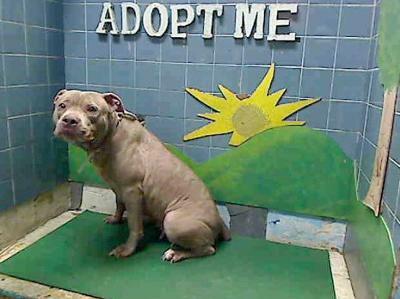 I came in the shelter as a OWNER SUR on 04/22/2011 from NY 10468, owner surrender reason stated was INAD FACIL. Reason for New Hope: TEMPER. 04/24/2011 Exam Type BEHAVIOR - Medical Rating is 2 NC - MINOR CONDITIONS NOT CONTAGIOUS, Behavior Rating is QUESTION, Weight 75.0 LBS. A volunteer writes: 3 year old Bear finds himself as our shelter, as his owner is also unfortunately going to a shelter. Bear was clearly a much loved pet: his tan fur is healthy and shiny and he is well fed. He is a little too well fed actually, tipping the scale at 75 lbs. He could probably lose a little weight. Bear's previous owner tells us that Bear loves men, women, children, dogs and cats. He is playful, was walked often and likes to go to the dog park, as well as sleep on the couch when it is naptime! It was clear when I had Bear in the park that he likes other dogs, both big and small, as he wanted to play with everyone that we met. As we came back to the shelter, a rescuer was picking up a cat who was in a cage and she stopped to talk to us. Bear simply looked at the cat and wagged his tail gently, so appears to be accustomed to cats as his previous owner mentioned. Bear is a low key, gentle calm boy who is making the best of a very unfortunate circumstance. He needs to be approached slowly as his world just was just turned upside down. But, he is a wonderful friendly boy who needs a new forever home with a couch he can call his own. Meet Bear in Manhattan today. DO NOT call unless you are going to go down there and get the dog. It is a waste of the staff's time to explain the adoption procedure over the phone, for someone to purposely not show up? They need every free second of their time to process Lost and Found checks and care for the animals. Not to mention people will think the dogs is safe and then they die. STOP IT OR I WILL TAKE DOWN THIS PAGE!!! !